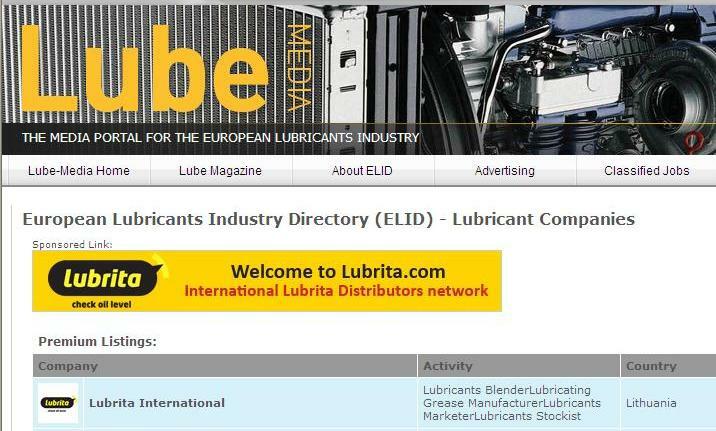 European Lubricants Industry Directory (ELID) is the media portal for the EUROPEAN LUBRICANTS INDUSTRY. ELID brings together information on base stock producers, suppliers, suppliers of additives and raw materials, lubricant stockists and distributors, suppliers of services and goods – plus trade bodies and Institutes societies. ELID will offer a simple and effective route to information on the European lubricants market and will provide producers, suppliers and customers with a valuable and easy-to-use reference tool. An entry in the ELID directory gives for Lubrita International organisation an excellent opportunity to gain exposure both in the UK and in the rest of Europe.